The idea is going around, pushed by the New Economics Foundation, Half Sigma, and others, that bankers are worth less than janitors to economic growth. Paid between Â£500,000 and Â£80m a year, leading bankers destroy Â£7 of value for every pound they generate. There is no question that our economic crisis is a direct result of the Oligarchs (a) betting money they did not have, and (b) illegally colluding with the Treasury Department to bail them out for those bad bets. If the US Government had been serious about protecting a ‘free market’ system of the national security crisis they created, it would have destroyed the wealth of the Oligarchs companies, and drafted the needed bankers until such time as the wealth they had destroyed had been restored. However, the US Government is not concerned with reestablishing a free market system. The Treasury Department has been captured by the Oligarchs. I don’t disagree with Bill Owens’ take on the Taiwan Relations Act, but The View from Taiwan notes that Owens’ wordds areÂ bought and paid for by the Communist Party. Of course, so are the remarks of our President. When the Oligarchs (the CEOs of Goldman Sachs and Morgan Stanley, the Secretaries of the Treasury Henry Paulson and Tim Geithner) looted our treasury, they did not only transfer wealth from Americans to their pockets. They assisted in a raid against the United States that changed our international position more than any single event since 1941. He said modern banking performed a vital function and described himself as just a banker ‘doing God’s work’. Two previous CEOs of Goldman Sachs were Jon Corzine and Henry Paulson. I wonder if they thought Goldman Sachs was on a divine mission, too? This is only a partial, limited victory. The whole point of “money-power transfers” is to give up some power in exchange for a lot of cash. Goldman Sachs is very effective at doing that. 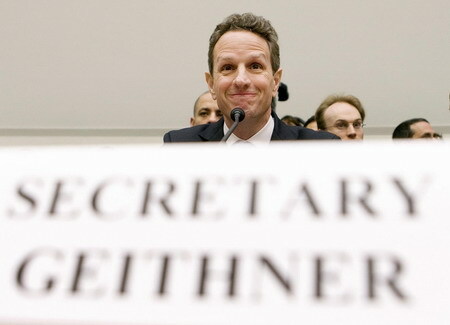 Worse, Tim Geithner is still Treasury Secretary, and there’s no gossip of Obama dismissing him. 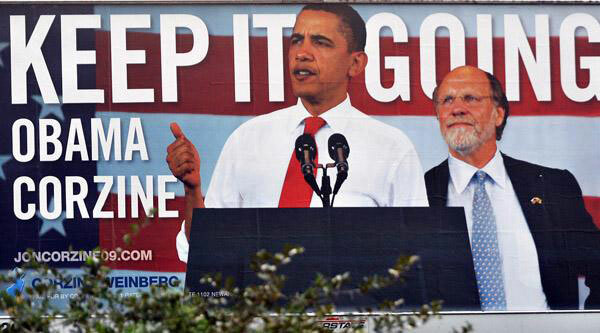 Still, I’m glad that the people of New Jersey ousted corrupt Wall Street banker (and TARP billionaire) Jon Corzine. Now that Obama is considering yet another stimulus-bailout, the only question is whether it will be structured to transfer the Treasury’s wealth to Goldman Sachs, unions or both. Peggy Noonan: This is something new in modern political history, and I’m not sure we’re fully noticing it. Americans are starting to think the problems we are facing cannot be solved. Such despair makes sense. The only people with a plan are the traitors — the national enemies — who are raiding our Treasury. Treasury Secretary Hank Paulson (ex-CEO, Goldman Sachs) and Treasury Secretary Tim Geithner (voted as head of Federal Reserve Bank of New York, by Goldman Sachs) somehow are unable to make their sweetheart bailout loan to CIT secured on anything — so the Treasury Department has just lost its entire investment to CIT. At the same time, Goldman Sachs deliberately deceived clients, making billions on a housing crash. Of course, this did not stop Goldman Sachs from collecting two bailouts to protect it from losses in the housing crash. Another former CEO of Goldman Sachs has been endorsed by Barack Obama for re-election as Governor of New Jersey. John Podesta, the president of the liberal think tank Center for American Progress and the head of Mr. Obama’s transition, visited 17 times. He met the president twice and Chief of Staff Rahm Emanuel four times. Business leaders had their share of visits as well, but not as numerous. James Dimon, chief executive of J.P. Morgan Chase & Co., was listed as visiting six times, meeting the president and National Economic Council Director Lawrence Summers twice. Jeff Immelt, chief executive of General Electric Co., had five meetings, but none of those were with the president, according to the records. Lloyd Blankfein, chief executive of Goldman Sachs, met twice with the president and once with Mr. Summers. Kenneth Lewis, the former head of Bank of America Corp., visited twice, meeting the president and Mr. Summers. via Presidential Visitor List Is Released – WSJ.com. Economically, the White House exists to prevent Goldman Sachs from ever losing money. It would be unfair to Goldman Sachs shareholders if they lose money, like investors in hick companies which live and die according to market forces. Interesting pieces, on how Federal Reserve Chairman Ben Bernanke and Goldman Sachs CEO / Treasuury Secretary Henry Paulson threatened to fire the board and manage of Bank of America, unless the Bank agreed to spend money on projects that were politically popular with the right people. Hard to believe someone actually thought that Goldman Sachs trading software was worth the trouble to steal. The value in Goldman Sachs isn’t its ability to actually make money on the market. That is just naive, and its typical of Russian foolishness that they bought into Goldman’s press releases. Rather, Goldman Sachs makes money through securing friendships with high government officials, and from there getting billions of dollars in grants. Some Americans may be surprised that the term Oligarchs (used to refer to high ranking friends of Goldman Sachs) did not even originate in the United States, but once only referred to powerful friends of Yeltsin and the Russian government.